My newly "lined" nursery curtains. 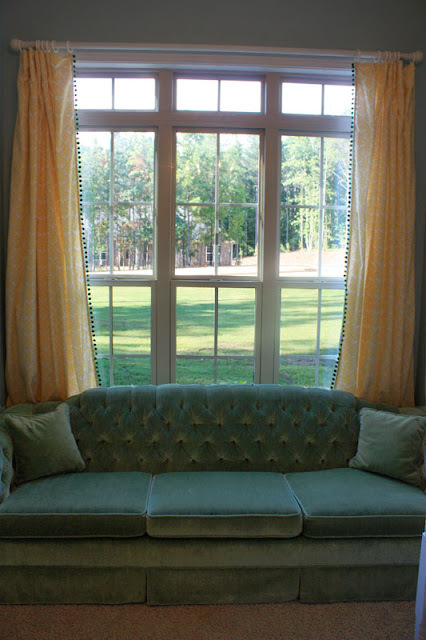 I love lined curtains -- how thick and full they are, how much heavier they feel, how they filter the light better -- everything except the price tag that normally goes along with them and/or the extra work that goes into sewing them. Not being one to spend money unnecessarily or sew where I can get by without, I've come up with cheater lined curtains. Here's my very involved, super complicated tutorial. Ready? Buy $3 white twin flat sheets from WalMart. Fold in sides and/or top to make slightly smaller than your curtain panels. 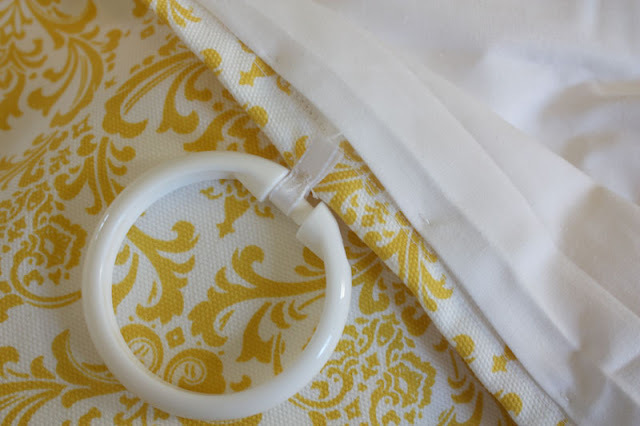 Use the clippy part of your ring clips to hang the sheet up behind the curtain panel. For those not familiar with the correct, super fancy terminology, these are clippy rings. If you're unfortunate enough not to have clippy rings on all your curtains (like me) you may actually have to do some sewing. I normally choose to do this by hand so the noise from my sewing machine doesn't distract from whatever re-run of The Office I have on at the time. I recently decided my nursery curtains were a little on the wimpy side and decided to "line" them. I didn't use clippy rings on these curtains, (I used shower curtain rings, remember?) so I had to pull out my needle and thread and get to work while Jim and Dwight kept me company. As an added bonus, here's a little something to help y'all get you through lining your curtains. Enjoy! Great idea! your curtains are so cute btw love them. The curtains look great! May I ask, where did you get the material? Also, did you sew the pom pom fringe on or just use fabric glue? That's beautiful fabric! It looks great next to the couch. YAY! That's one of my FAVORITE episodes! Such clever pranks = great belly workout! I also like your easy solution for the lining. Great thinking! What a great idea, I have some curtains that badly need to be lined as well. I love your curtains by the way, so pretty! Amanda, I forgot about that one -- it was great! I also like the one where Jim faxes Dwight messages from himself from the future on his letterhead! Love those curtains! Found you from The Nesting Place. Going to follow you to see those babies! Plus I loved that Office video-that show cracks me up! I'm so glad I found you. Not only are you an adorable adoptive momma...you love craigslist and DIY decorating. I LOVE IT! :) PS. I saw that you got to meet your compassion boy! We have a boy with holt international that has a family, and I would love to meet him while we are there finalizing our adoption. We will have to see if that can happen!! Nice to know I am not the only person to put shower rings on curtains LOL Cheaper than the wood sew on ones. I am one that loves to sew but does not always have the time. I usually line my curtains but the cheap sheet trick is cheaper than my lining so will have to get those next time, plus the header gives you the nice heavy bottom hem! I think this is a great idea. Thank you for the helpful tips. However, as a person of color, I wish you would have used another adjective beside "ghetto-ness." It's offensive!